Posted on October 3, 2016, in Bible Study, Persecution, Understanding and tagged Bible, Christianity, Church, Jesus, Persecution, Satan, understanding. Bookmark the permalink. 22 Comments. Dear Ron, you are truly blessed and us through you! Sometimes the things we don’t understand can become stumbling blocks in our walk with the Lord. It was at such a moment in my own life recently, when I was agonising about the evil that surrounds us, that the Spirit led me to your blog. What I have learnt from you is truly awe inspiring and I have spoken to many others of the incredible revelations that God has provided through you. I pray that He will continue to do so as we hurtle towards the “end times.” God bless. Am a new follower of this blog and truly you’re a great blessing . I humbly thank God for you and it’s wonderful to hear that all my other brothers and sisters share same gratitude towards you.Glory to God ! The Lord bless you and yours dear brother of ours ! Hello Ron, thank you so very much for this teaching. Some of it was in my heart already and some was a great gain / revelation. I do believe that one of the major subjects / teachings throughout the whole Bible is to live “Love”, because if love is deeply rooted in your heart / lived, you will simultaneously live all what love contains, like kindness, sharing, caring etc. I once prayed at the altar to “become” love, meaning, to be able to love like HE does, unconditionally ( not knowing at the time, what I was really praying for, meaning all that comes with it). This prayer was answered to a certain extend, as I noticed in time. Today there is no hate to be found in my heart at all and forgiveness became very easy to perform, no matter what was done to me. I’ve heard myself saying many times, “Father for give him / her / them, for he / she / they know not what they do, knowing, that they did it out of ignorance. I really really do appreciate what you do and I’m very thankful for it. And I’m so very thankful, that you make it all available to us for free. May GOD bless you richly Ron. Oh, my, I found your site last night and except for my regular time in the word I have been reading your teachings till now!! I feel like God has answered my prayer to find a site that has some real ” meat” and truth so that I can learn more of Him. One day I will email you and tell you of my journey to Christ but for now just know I am so happy to have found you! God bless you my new found brother in Christ and God cont. to give you wisdom to help others!! I am always humbled by how the LORD has used me to answer the prayers of people like yourself. I do appreciate your comments. God Bless you. What more can I say..? I bless God 4 ever leading me to your site. You’ve been more than a blessing to my spiritual life. I know your blessed already but God will kip blessing you with MORE wisdom and knowlegde. God bless you for these Revelations! I am better informed about the strategies of Satan. May grace be multiplied unto you in Jesus name. Our prayers have been answered. I am determined to keep my Faith strong and non-wavering. As I write this post tears are in my eyes. You are such a Blessing Bro. Agapegeek. You do not realise the depth of the Blessings that we are receiving from the Spiritual Food that you serve us. Please know that your lessons are appreciated greatly. God Bless you and your family. I know that you will reap great rewards from OUR FATHER for your efforts to spread HIS WORD freely. Be encouraged. Thank God that you are back. 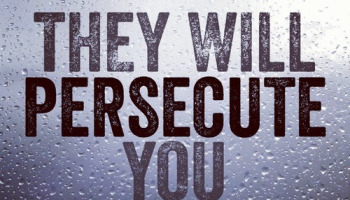 I re- read part 1 of Understanding Persecution and completed part 2. I have no direct questions right now. I have completed “Bible Faith” and I am now making a conscious effort to practice receiving HIS promises and building my Faith. I’ll testify as to my future Spiritual Growth. God Bless you Bro. I sent you a couple emails but have not received a reply. Thank you again for your previous support. Thank you so very much. You are a tremendous blessing. Learning new things through the Holy Spirit in you. I went and did a recap of part 1 when I was notified of part 2. I have waited for long. Thank God you are back. God Bless! I want so much to bless and encourage you the way that you have blessed me so when I read that you would be excited to hear my testimony, I decided to reply. What can I say, my heart has always been hungry for the Truth. As I lay on the bed listening to radio music as a young teen, I remember crying and thinking that surely there must be more to life than just living and then dying.The Lord heard the cry of my heart, and the day I asked God to lead me to a church(as there were so many churches that I didn’t know which one to go to find God), I found a flyer on the car windscreen about a speaker at a AOG church and so I went along that night and was born again of the Spirit of God, I became a Christian at the age of 18. I married within six months of my salvation, to a wonderful man with a heart for God and people. We pressed into God and was very active in the church. We grew so much in those days and a good foundation was put down deep into our lives, one that has sustained us all these years, thirty six years of marriage. The children came and the pressures of life crept in, unsaved family relationships made demands on us and “church” changed over the years and wasn’t the same. Our three children all hit the teen years at the same time and we had no support. I remember the day when I realised that we weren’t being transformed by the renewing of our mind through the Word, we weren’t being changed. In fact, I felt worse after going to church, as so we slowly but surely stopped going and sad to say, not one person ever called or enquired of us as to why, how sad… We never stopped loving the Lord and had fellowship with other Christians when we could. Our disappointment was with the “church”, not God. My husband threw himself into his work after the children left home and we tried a few different churches. My hunger for God has never left and as always even from the beginning, I’ve always understood spiritual things by observing the natural things. Our bodies need a well balanced diet which is found in a variety of foods from different sources so when I feed my spirit, I gather from a wide source of places, gleaning what I can, so that I will have a well balanced healthy spiritual life. Praise God, you have been one of those sources that has fed my soul through some lean times. Thank God for your commitment to love and serve Him. In recent times, my husband Russell’s heart has been stirred and now we fellowship at a church led by a young couple with a heart for God and for His people. Praise God. So we have just started to open our home for people to come each week just to fellowship and grow in God. It’s been a long time coming, but we know that’s part of God’s plan for our life. That’s my testimony in a nutshell. I pray that you will continue to do His Will as you are blessing and encouraging many of your brothers and sisters in the Lord by doing so. God Bless. Thank you so much for sharing. You are blessed and a blessing. Thank you Tom for your kind comments. God Bless. I have enjoyed being reminded of some BIBLICAL TRUTHS. Being reminded like this helps to keep me sharpened.